Hemel Hempstead Town take a break from their league frustration on Saturday when they travel to Eastbourne Borough in the FA Trophy. The Tudors will go into the game still smarting from their painful 2-1 Vanarama League South defeat to leaders Ebbsfleet United on Saturday – a game they were leading 1-0 as late as the 89th minute. Two late, late goals secured an ill-deserved win for Ebbsfleet, as Hemel’s search for a first home win in the league since September 15 continues. A tight game is expected at fellow Vanarama South side Eastbourne. The teams are level on 23 points in the table from 17 games apiece, and have yet to meet in the league this season. 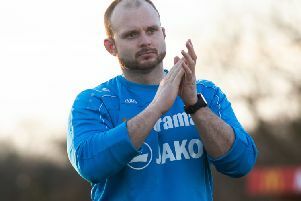 Hemel boss Dean Brennan insists that his side have learnt from Saturday’s defeat, and are looking forward to the trip to Eastbourne. “It was a tough, tough defeat to take but we’ve had a chat about it as a group and we’ve just got to put it behind us now and try and learn from it,” he said. “I can’t really complain about the way we played because we did well – we were just perhaps a bit naive at the end. On this weekend’s game, Brennan continued: “The FA Trophy is a great competition and we know (Eastbourne manager) Tommy Widdrington well, being an ex-manager of this football club. Hemel have struggled with injuries this season, and they will be missing key players again on Saturday. Brennan said: ““We go into the game with a lot of injury concerns - Matty Spring is injured, Ben Herd is suspended, Dennis Oli is out, and it looks as though Michael Richens will be out as he didn’t train this morning. “We’ll just get on with it, patch a team together and try to perform like we did last weekend. Hopefully we will be on the right end of the result. “You need the breaks in the cup, as I always say. If we are nice and resilient like we were against Weymouth in the last round, I think we will have a great chance of going through. One player who Brennan will be looking for a big performance from is recent loan signing Zane Banton. Talking about the qualities of the Luton Town youngster, Brennan added: “I’ve always liked Zane and I’m a big admirer of his work ethic – he’s got good quality and a good turn of foot. “He’s a real team player who makes good sacrifices for the team, and with Dennis Oli out we needed someone to fill that space on the right hand side. He’s a good option for us. “Stilly (Luton manager John Still) let him come here to get some more experience, and we are grateful for that. It’s good for Zane as well because, despite being a young lad, he’s fairly experienced at this level.